Pinnawela orphanage is situated northwest of the town Kegalla, halfways between the present capitol Colombo and the ancient royal residence Kandy in the hills of central Sri Lanka. It was established 1975 by the Sri Lanka Wildlife department. This 24 acres large elephant orphanage is a also breeding pace for elephants, twenty elephants were born since 1984, and it has the greatest herd of elephants in captivity in the world. From the Dehiwala Zoo it was shifted 1975 to Pinnawela. At the time it was shifted the orphanage had five baby elephants which formed its nucleus.It was hoped that this facility would attract both local and foreign visitors, the income from which would help to maintain the orphanage. 08.00 The babies are fed on milk in the mornings and allowed to range freely on the 12 acres large grassland. Beteween 16.30 and 1800 in the evening the animals are taken to their stalls and tethered for the night. Plenty of food and water are available. The leaves are mainy Cocunut leaves (Cocos nucifera), but also branches from Jackfruit (Artocarpus integra), leaves, branches and logs of Kitul palm tree (Caryoty urens), from There is no stress or threat to the animals. The elephants are stall fed. There is very little food material that they can gather from the premises of the orphanage except grass. Large quantities of food are brought in daily. 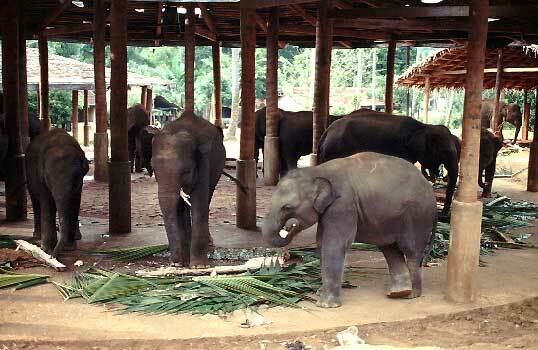 Jackfruit, coconut, kitul, tamarind and grass form the bulk of the food given to the elephants at Pinnawela. Each animal gets approximately 76kg of green matter a day and in addition each gets 2kg of a food mixture containing maize, rice bran, powdered gingelly seed and minerals. They have access to water twice a day from the river Maha Oya that runs by the Orphanage. There is one female named Sama which was brought in from the northern part of the country, where there is an ethnic conflict, with the lower part off ts front foot blown off by a land mine. This animal is growing up and is coping with that leg about six inches shorter than the other. The conditions at Pinnawela are conducive to breeding. Initially the breeding animals consisted of males Vijaya and Neela and females Kumari, Anusha, Mathalie and Komali. Upto the middle of 1998 there have been fourteen births, eight males and six females at Pinnawela, with one(1) second generation birth early 1998. The father of the first three calves born at Pinnawela was Vijaya. It was not possible to determine the father of the next calves since many males used to mate with the females in oestrus. Now through DNA fingerprinting the fathers of three have definitely been identified. Vijaya and Kumari have produced three calves at intervals of five and four years. The first birth at Pinnawela was in 1984, a female, to Vijaya and Kumari who were aged 21 and 20 years respectively at the time of the birth. In 1993 Vijaya and Kumari were 30 and 29 years respectively. There are other records of the birth of elephants in captivity in Sri Lanka but most of these are off females that had been captured after they had conceived in the wild. There are also records of tamed elephants having mated with other tamed elephants and giving birth. These are however few and far between. Newly the elephant Kirimenika died (May 9, 2004) due to that the top portion of the elephant's windpipe was very small (four cm. curvature) and its intestines had been twisted. The resultant filling up of air in the stomach had caused the difficulty to defecate. The air pressure on lungs caused breathing difficulties leading to the elephant's instant death. The other elephant deaths in recent times are as follows with the relevant date and cause of death: Vijaya - September 11, 1999, brain cancer, Kandula I - January 29, 1999, heart attack, Sanka II - May 14, 1999, old age, Anura - March 31, 1998, rabies, Honda Kota - February 20, 1999, severe injuries to the trunk and body at the time it was handed over by the Wildlife Department, Binari - January 3, 2003, head injury and paralysis, baby elephant born to Lasanda - March 20, 2004 dashed on the ground by the mother and baby elephant of Nikini - April 22, 2004, born dead. In 1997 and 1998 research was conducted in Pinnawela through a joint venture by Institute of Wildbiology at Vienna University in Austria and the Zoological Institutes of Colombo and Peradeniya in Sri Lanka, under the supervision of Dr. Fred Kurt. Veterinary students from the Universities collected datas about body messurements and growth, food assimilation, social interactions, sleeping behaviour, tool-using, and sterotypical behaviours, later publicated in different scientific medias. Pinnawela elephant Orphanage is supervised by Mr H.A.N.T. Perera, director of the Dehivela Zoological Gardens in Colombo, and DVM. Mr Raja, Pinnawela. Information provided by Jayantha Jayewardene, Biodiversity and Elephant Conservation Trust, 615/32 Rajagiriya Gardens, Nawala Road, Rajagiriya, Sri Lanka, and Dr. Fred Kurt, Institute of Wildbiology at Vienna Veterinary University . Here in Pinnawela is also the three-legged elephant Sama, who by two years of age stepped on a landmine which blew her right frotfoot away. Since then she is walking on three legs. She is now twelve and will suffer from considerable discomfort in the future due to changes in her spina, because of her annatral body position, trying to balance the body weight on three legs. There is ambitions to train her for a specially made Prostestis, see http://www.luckysama.de for more information. Fred Kurt, (1974) Remarks on the social structure and the ecology of the Ceylon elephant in Yala national Park. IUCN Publications new series 24 (1) 618-634. Fred Kurt and J. Kumarasinghe, (1998) Remarks on body growth and phenotypes in Asian elephant. Ecological genetics in Mammals III, Acta Theriologica, Suppl. 5: 135-153. Elephant in Sri Lankaby Jayantha Jayewardene, member in the IUCN�s Asian elephant specialist group. 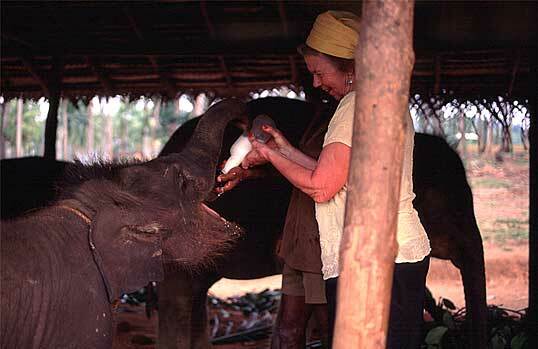 Work with rescued elephants in the Pinnawala Elephant Orphanage !